LinkedIn will guide you through the process of creating your profile. But there are a few important details that you should keep in mind to help you create a dynamic profile that separates you from the crowd. Select professional images. For your profile picture, you’ll want to upload a recent professional-looking head shot (ideal image size is 400 x 400 pixels). This doesn’t need to be taken by a professional photographer—simply dress in your usual business attire and ask a colleague to take a picture with a digital camera or smartphone. Another great feature recently added by LinkedIn is the option to add a background photo, which I highly recommend. Be sure to choose a photo that accurately portrays your business (recommended image size is 1,400 x 425 pixels). Build a detailed profile. It’s important to include as much information as you can in your profile. Here, the most prominent content section is the Summary, so make sure it tells a compelling story of who you are and how you help your clients (avoid just using bullet points). If you specialize in a niche, be sure to highlight it. Add details under Work Experience, Education, Certifications, and Volunteer Experience & Causes. The latter category will help personalize your profile and let others know which causes are important to you. Use the Skills section to focus on your strengths (e.g., retirement planning). Helpful hint: Since you can’t bold words in LinkedIn, one option is to capitalize the different sections in your Summary to enhance select areas. Creating a LinkedIn profile is only of use if people can find it. To help drive traffic to your profile and make sure it shows up in search engine results, customize your website links and add keywords. Customize URLs. Creating a unique public profile URL not only gives your profile a more professional look, it will also be easy for others to remember. Here, try to include your full name. For example, my profile URL is https://www.linkedin.com/in/alicianewton2. Your profile URL will display below your profile picture, and you can use it in various places to direct others to connect with you (e.g., your e-mail signature, website, and business cards). Helpful hint: When adding your website to your Contact Info, select Other to type in your website title. Include keywords. Adding relevant keywords can also help drive traffic to your profile. So, focus on keywords that are related to your area of expertise (e.g., wealth management) and include them in the Summary section and in your Headline. Be sure to add words where it makes sense with the rest of the copy; don’t just throw in words to have them. Helpful hint: Use the divider symbol (|) to separate different titles and keywords in your Headline. 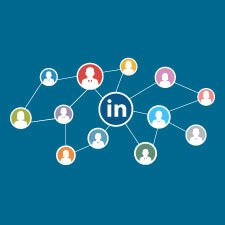 One of the most important aspects of creating a LinkedIn profile is to connect with other individuals, including current clients, colleagues, and prospects. A reasonable goal is to establish 500+ connections. Just remember, though, it’s important to have quality connections, not just quantity. Once you have connections, be sure to stay in touch by reaching out to them when they hit important milestones. Helpful hint: By going to My Network > Connections, you can see when your connections have work anniversaries and birthdays. You can also keep track of these client details by adding them to your CRM. To help you stay front of mind with your connections, you’ll want to post content and engage with users. By sharing original content, your contacts will see you as a thought leader in the industry. Post frequent updates. A good rule of thumb is to post content at least once per week. Here at Commonwealth, we recommend that advisors post content in the Share an Update box on the homepage versus Publish a Post. Most users share links to articles, so the Share an Update box is the best place for that. Share content that appeals to your target audience, such as industry insights, company news, blog posts, and so forth. Just be sure to add in your own thoughts! Monitor homepage feed. When you first log in to LinkedIn, you will be on your homepage. This is a great place to see what your connections are up to and what content they are sharing. Helpful hint: You can choose to sort by Top or Most Recent posts. Under the Publish a Post box, hover your mouse over the three dots to choose whether your posts shown are Top or Most Recent. Browse your homepage feed to engage with your current connections. If you see an article of interest that one of your connections posted, you can like, share, or comment on it. Whether posting your own content or engaging with someone else, your connections will see your activity in their homepage feeds. Groups are a great way to find thought leaders in your industry, plus expand your visibility as an expert in your field. Within groups, you can share content, ask questions, and connect with like-minded individuals. When you first join a group, it’s okay to sit back and read the discussions before chiming in. This allows you to see what types of content users are interested in and helps you identify other experts. Once you feel comfortable, start sharing articles of interest with the other group members. Find groups. In the search bar, type in professional organizations, local groups that you’re a member of, or industry publications (e.g., Financial Advisor magazine) to see if there is already a group that you can join. You’ll need to request to join the group, and the administrator will review your profile to ensure that you meet the membership criteria. Helpful hint: As of October 2015, all groups are now set to private. This means that only group members will be able to post and see shared content. When LinkedIn is used alongside your other marketing and social media activities, you can showcase your industry experience and help build your professional brand. Once your profile is set up, don’t just “set it and forget it.” As you meet new people (e.g., at a fund-raising event), send them a connection request. By continuously adding to your network, you will be getting the most out of LinkedIn and successfully grow your business. Have you had success bringing in new clients with LinkedIn? Share your comments below!